Prices based on two people travelling by private vehicle. There are three UNESCO biosphere reserves in Morocco established to encourage sustainable development (the Argan biosphere, the southern Morocco Oasis and the Mediterranean Sea Reserve [with Spain]). 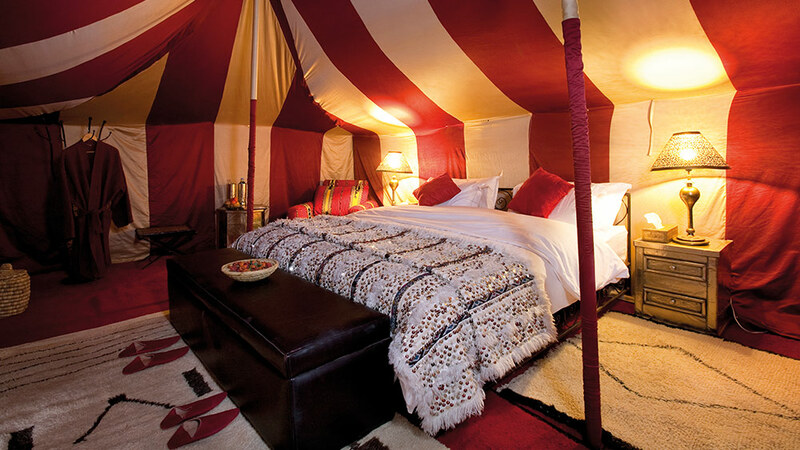 Luxurious desert camp Erg Chigaga, stay at one of the finest tented accommodations in the Sahara Desert of Morocco. 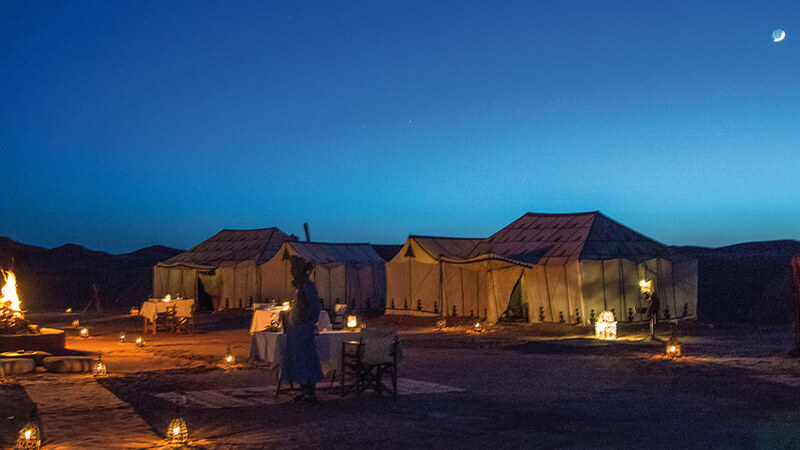 The deluxe desert camp at Erg Chigaga offers pure luxury at every level but retains the spirit of the culture of the Sahara Desert. It is run exclusively by a Berber team who all originate from the area. The team are true professionals, and lots of fun, and know how to make everything run as seamlessly as possible in the desert. Service is relaxed and friendly. 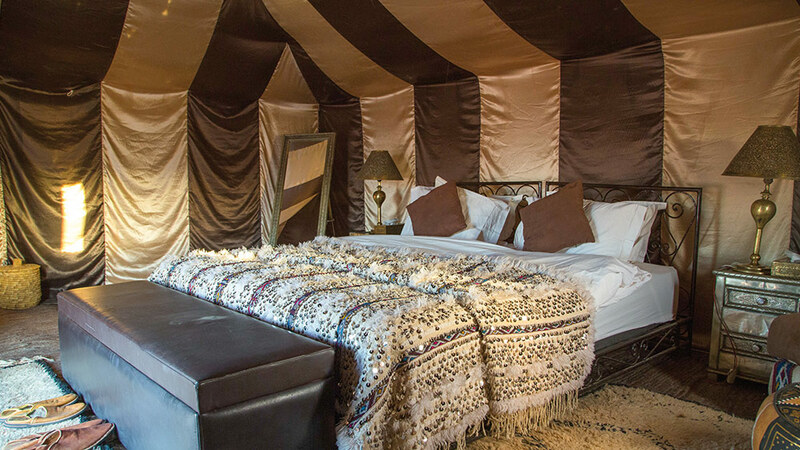 The attention to detail is superb; each spacious guest tent is replete with private, en-suite bathroom tent with toiletries, and fully-furnished sumptuous bedrooms completed with wall-to-wall rugs, armchairs, mirrors, lamps, and the finest bed linens. All the furniture is hand-made. 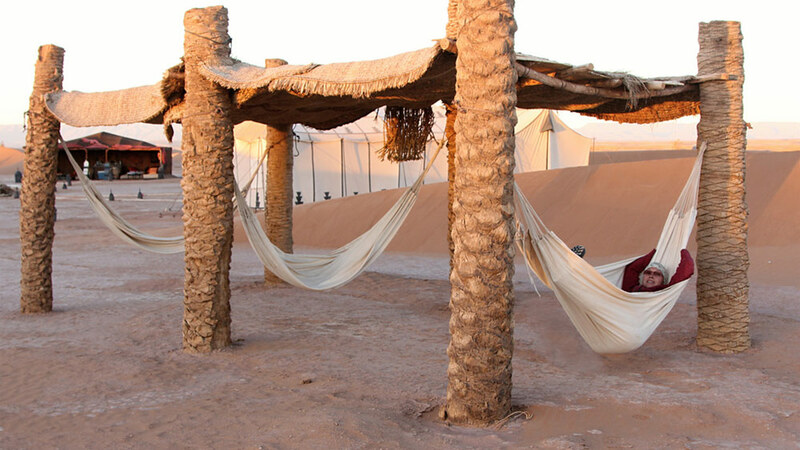 There is even a well-stocked bar/salon at the camp, cosy outside relaxation areas, hammocks and a telescope. 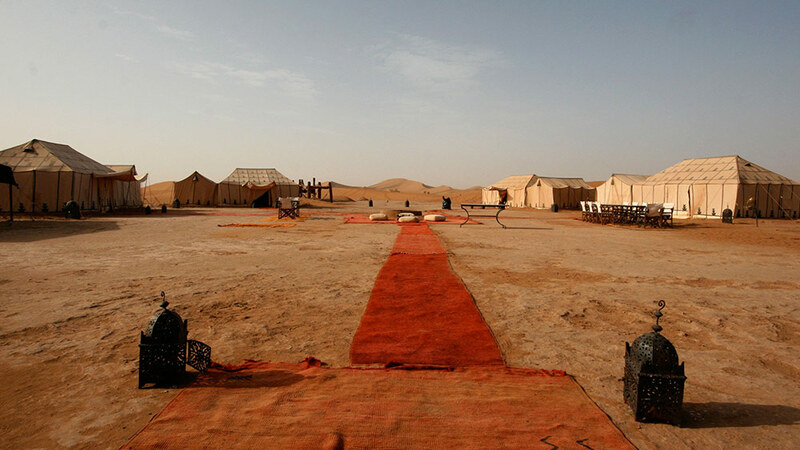 Electricity is provided in the guest tents in the evenings via solar power. This is a unique opportunity to enjoy a beautiful wilderness in the most luxury of accommodations. Guests can dine around the campfire while being entertained by local musicians. Or take an aperitif at the top of a tall sand dune to watch the sun set. 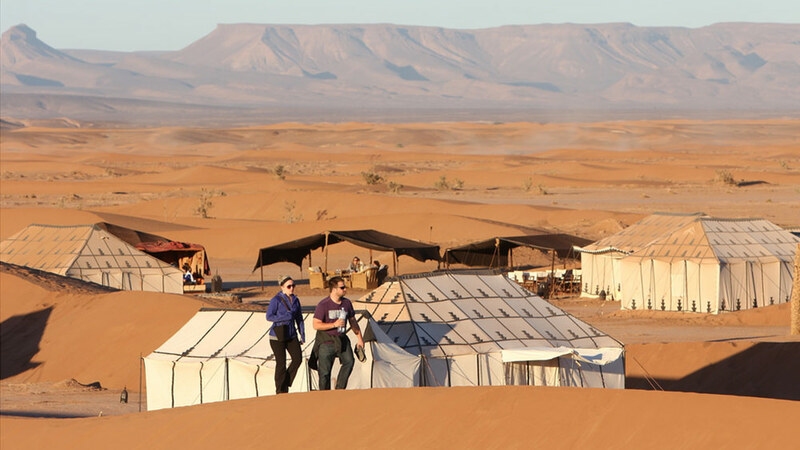 Further activities, amongst the dunes, include sand boarding, walking, camel riding and 4×4. All meals, drinks (including alcohol) and activities are included in your stay. Please refer to our optional itineraries for further details of our tour packages – four day Deluxe camping or five day Deluxe camping.